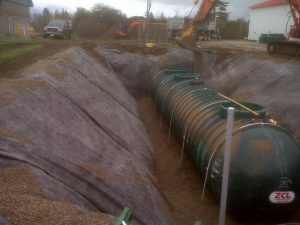 Sutherland Excavating Ltd. installs all sizes and types of petroleum tanks, including heating tanks, industrial tanks, and commercial-retail installations. We have installed steel, fiberglass and composite tanks. We have overseen installations as large as NB Power Belledune to as small as 200 gallon home heating tanks. The company has installed aviation fuel tanks and provided bulk plant installation services. We have built complete turnkey petroleum systems such as Ultramar Car Wash— 888 Mountain Road Moncton, Joe’s Gas Bar, Miramichi, and Eel River Truck Stop—Eel River, New Brunswick. The company has installed several hundred heating tanks all over New Brunswick, from large industrial tanks for NB Power to small tanks for garages, industry and government. Sutherland Excavating Ltd. offers bulk tank cleaning and repair service. We can empty the tanks, de-gas and clean them to make them ready for thickness testing. After the testing, we can perform any repairs necessary. We also perform demolition of bulk tanks. All our workers and training meet the strict requirements of the major oil companies. We install and service oil/water separators for any facility. We can clean and test your separator. This should be done every 5 years minimum. Sutherland Excavating Ltd. is proud of it’s 20 years experience installing and maintaining petroleum storage tanks in New Brunswick. We welcome any customers to call anytime for a free consultation. References are available upon request. All our workers and training meet the strict requirements of the major oil companies. We also sell and install waste oil tanks and transfer pumps.